This entry was posted	on Wednesday, July 25th, 2007 at 4:37 pm	and is filed under Latest Comics, Main Blog (All Posts). You can follow any responses to this entry through the RSS 2.0 feed. Both comments and pings are currently closed. 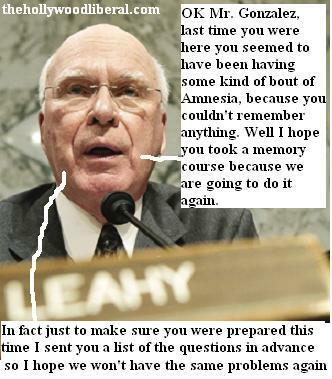 Oh yes ole Senator Leaky Leahy himself. This guy is one of the biggest hacks in Washington. To CCV: Just so I have this straight, the perjury/obstruction of justice/treason/war profiteering are A-OK , RIGHT? Just checking. sigw: Are not “…perjury/obstruction of justice/treason/war profiteering are A-OK,” not the exception to government, but the rule. There isn’t a single congressional district in the country that does not receive some amount of green welfare.As the Jack Nicholson character in Easy Rider so blandly put it,”It’s kinda hard to be free when your life can be bought and sold in the marketplace”.As long as we pursue the business of death and dismemberment in our national policies,then the reply to your question is yes.As long as the people collude,tacitly or otherwise,Americans will not be free. sigw: So is the solution to provide every congressional district ever more increasing power, debt spending, and tax revenues? My statement says there is no difference between the parties. They all collude against the people. Why pick on Gonzalez. As far as what is going on, does not his “scandal” rate a zero? The people would still like to have a say in their government,beyond a dog and pony show whose outcome seems to be the dismantling of the Congress re its coercive capabilities,then by extension the power to declare war.If the perception is that it has become irrevelant,and this is seconded by a toadying DOJ, the pRes won’t have to bother with EO’s or signing statements any more.As well, the need to bother with rigging elections goes away,but we’ll still look forward to the 4th of July.We just won’t know why. sigw: If Congress had not met (been dismantled) the last 100 years our standard of living would be more than ten times higher than it is today. I wish they would go back to part time and would quit stealing our money. If what you’re suggesting is a tax on income and not the wages paid on labor, I’m right behind you in that line. Congress used to be responsible for its own pay(not to mention healthcare). Joe fourpack(inflation) has been bullied into funding DC’s bloat, with the attendant out of control military apparatus we have suffered under since WW11. Yeah, income tax did/does so many wonderful things that the feds couldn’t see getting rid of it there in’45. Some good has come of it,some programs serve the people but by and large it is servitude/taxation without representation-unconstitutional AND unAmerican. sigw: Would you please explain to me what government programs have done any good? Government is the problem, not the solution.